We spoke with CEO and Designer of Ashley Purdy Fashion Inc. and bassist for the band Black Veil Brides, Ashley Purdy, about the launch of his new custom fashion line, his personal style and history of design, the fashion industry and so much more! 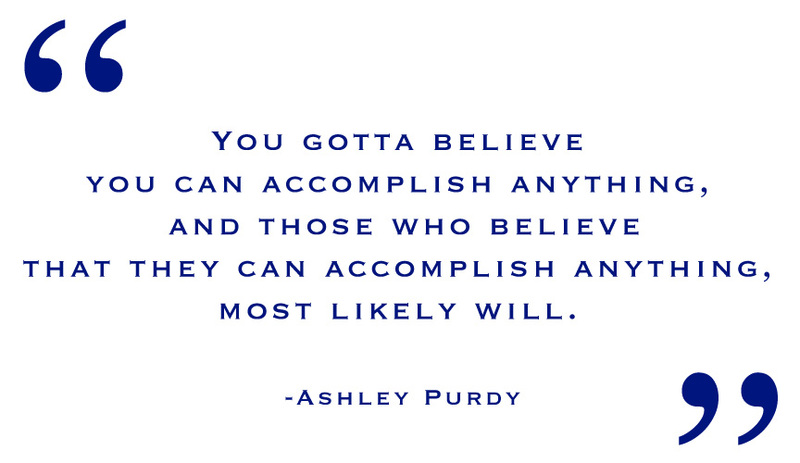 Ashley Purdy – CEO and Designer for Ashley Purdy Fashion Inc.
I’d like to start off by congratulating you on the launch of Ashley Purdy Fashion Inc, how exciting has this been for you so far? It’s definitely been one of my long time passions of things to accomplish. I’m glad to have finally checked off that box of officially becoming a fashion designer. I had my debut launch on 3/30/13 at Forgotten Saints on Melrose in Los Angeles where AP Fashion Inc. is sold retail. March 30th, also happens to be my Grandmothers birthday, the woman who raised me, so maybe giving birth to my Fashion Co. on her birth date will be a good omen for its success. Was it a long time in the making? Time was the major factor in getting it off the ground while having many other projects i’m involved in. I just needed ‘any’ time to make it all come into fruition. So this past year in between tours and while on tour I was setting up the business side of things such as my partners, my team, the LLC and getting the company Incorporated, whilst creating the over-all scope of the designs, look and aesthetic of the brand itself. Ashley at the Launch of Ashley Purdy Fashion Inc. at Forgotten Saints in Hollywood. What is it that draws you into the fashion world? Is there anything that you particularly like or dislike about the industry? I’ve always had an interest in the fashion industry. Fashion advertising and lifestyle branding has always been intriguing and provocative to me. It’s not just clothing or style that I had interest in, it was more the marketing side of things that I had intrigue in. It’s about selling a lifestyle or a brand, or you could say a dream. Another form of escapism such as rock n’ roll that existed and that I was eager to be apart of. I think that sense of wonderment and fantasy through fashion is what drew me in most. How did you get started with fashion and when did you realize that you wanted to be a designer? Well, from since I could remember I’ve always been an artist, drawing, painting and so forth. I would also always draw made up rock n’ roll characters in a band who each had their own style and personalities. I think by accident I was already becoming a fashion designer so to speak. Drawing outfits and styles on make believe characters who I wish I was or was in a band like. Also, through my developmental school years I was designing logos for the schools shirts or fundraisers. My Junior year I was predominantly involved with designing the new Football uniforms, shirts and other logo based collateral. As I matured, I’ve always had the dream of one day either having my own clothing line or owning a fashion magazine. I took all the necessary steps in doing so. I studied at the Academy of Art in San Francisco for some time and transferred to Otis College of Art and Design in Los Angeles, where I graduated with a BFA in Communication Design with an emphasis on Marketing and Advertising. Most of my thesis’ and projects in school were fashion and advertising based. Do you remember the first article of clothing that you ever designed? I’ve always been altering clothing my entire life. But I would have to say my first real amateur endeavor would have to be drawing, designing and then literally cutting and sewing every piece of costume for my first band I formed in Hollywood. I assume that the design process differs from designer to designer, could you walk us through your own process from an original concept to production? Well, first it begins with all ideas already pre-planned in my head about the collection or brand. What will the concept and collection be. Then taking that concept to paper. Just old school style, sketching out designs, patterns, then layout a style chart or board with fabrics, colors, inks and detail choices to see what everything looks like together. This begins creating a collection so you can see if everything is seamless and belongs together. From there its sourcing the materials to create the designs. Going to various manufactures and pricing out cost of goods and finding reasonable priced materials to determine retail costs after production. Then its cut / sew and print time, as well as putting together the accessories. Finally, dressing the items on models or mannequins to see how they look, then off to photograph and post to web. 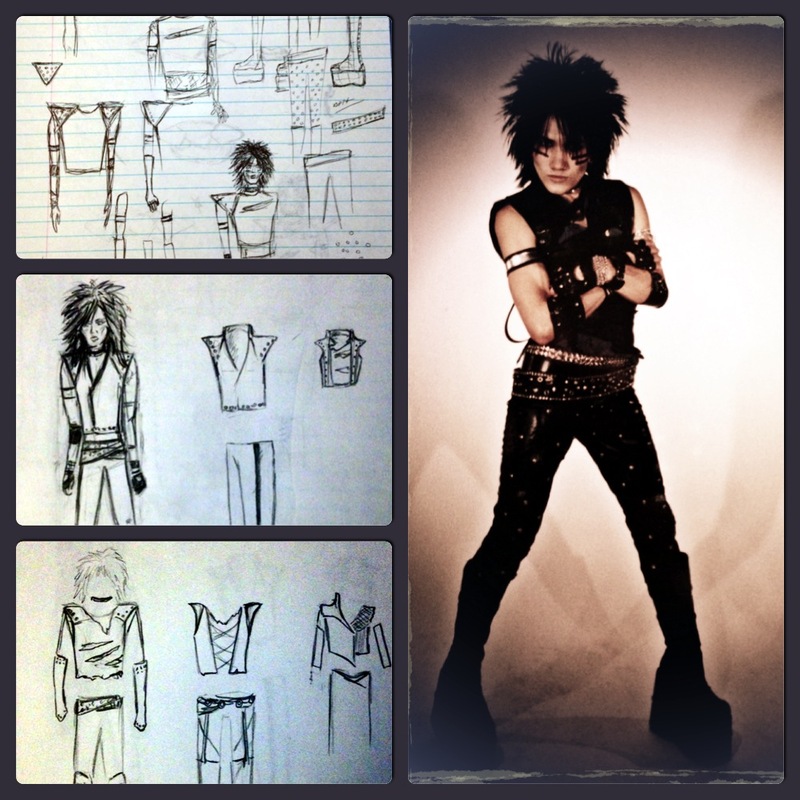 The original sketches and photo of the first band designs Ashley created. Could you describe your style with one word? I noticed that there is a recurring “Outlaw” theme within, could you elaborate on the meaning behind that? 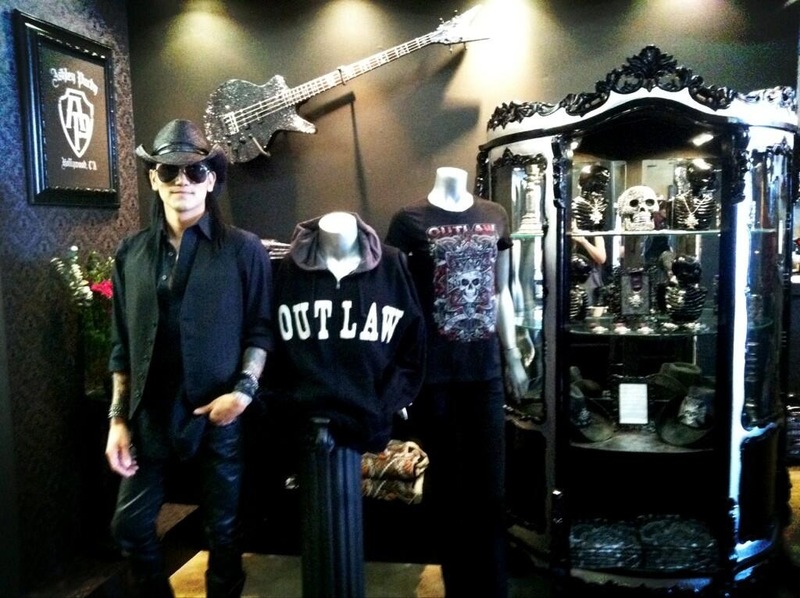 ‘Outlaw’ is just one of the collections under Ashley Purdy Fashion Inc. However, Outlaw is the general sense of rebellion and being a renegade. A sense of entitlement and taking things into your own hands. Its the tougher side of AP Fashion from its counter-part ‘PurdyGirl’. How does your line represent you and what elements help it to portray your personal style? And with that, who would you say is the target audience of your designs? Well, my collections are a reflection of my personal style and interests. All the textiles, fabrics and patterns are of my personal choice. I’ve already established brands within myself such as ‘Outlaw’ and ‘PurdyGirl’ that fan bases and groups have attached themselves to as a sense of belonging. I’m very current on style and trends, so some articles of clothing adhere to current fashions, but for the most part its about what I like and want to see that resonates with the sophisticated alternative consumer and the people who follow me. 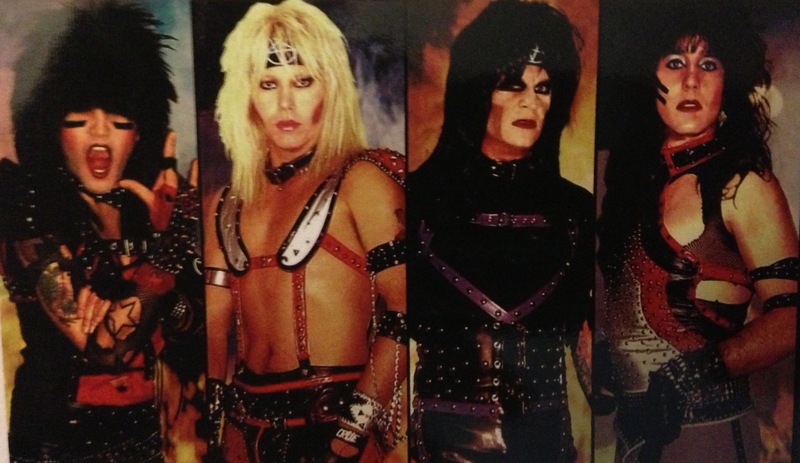 Early band costumes which Ashley designed and created. The fashion industry is pretty competitive… what is it that you believe makes your line stand out and what makes it unique? First, I think someone’s biggest competition is themselves. I stand out as a ‘fashion’ designer and not to be confused with, (people who call themselves ‘clothing’ designers, who just print designs or logos on pre-existing t-shirts), because what I have created is custom fashions that are a personal extension of myself and my personality. It’s pretty unique since there is only one of me. My main intention was to not only create collections that defined myself and style, but to also create things that my fans identify with me and feel a belonging to. What have been the biggest challenges that you’ve had to overcome with this line so far, and along with that, what have been the biggest rewards? There are so many more custom pieces that i have conceptualized and want to make, but fitting them within a budget that works for my consumer is the biggest obstacle. So far i’ve created a lot of custom limited pieces that are very popular for the line and will continue to do so. However, the price will reflect that for producing the limited custom items, but for the most part i try hard to source materials so that AP Fashion stays reasonable for all ranges of buyers. Within the line I am very conscious of having a range of items from higher ticketed custom pieces to inexpensive accessories so that everyone can be a part of and purchase AP Fashion. The biggest reward is seeing via social media people sending me pictures back with excitement of what they bought from my fashion line. I ReTweet most everyone i see who tweets a photo. You’ve had quite the busy year thus far with the compilation of not only the clothing line but the work you’ve done with your band, Black Veil Brides, as well. You’ve been out on tour, released and re-released a brand new record along with a movie… How do you manage to find balance in terms of time management and organization with so much going on, especially while out on tour? I think time management and dedication are the main factors along with being an organized person. To say I was highly ambitious would be an understatement. I’m never one to sit around, I always have to be creating in various facets to keep myself entertained. If you want to make something happen in your life or career, well then you make and find the time. Simple as that. There’s still a lot more that even I want to accomplish thats on my radar. The band has been known for having a certain edgy or dark style, do you think that style has had any effect on your designs? Well, I had my own style before I was in BVB. So its a culmination of things where I had just become one of the predominant factors to BVB’s developing style. My personal style has always been darker, edgier and more high fashion, I brought part of that sensibility to BVB. The fashion line itself was just an extension of that but more broad. 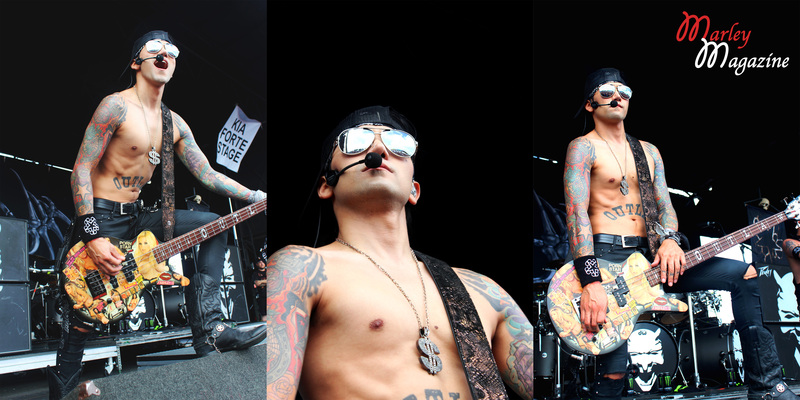 Ashley performing with his band, Black Veil Brides, at Vans Warped Tour on Long Island. Which designers would you say are your biggest inspirations and how have they impacted your line? Anyone who had something to say, who was to get a reaction from the audience, not only dressing models but creating art. Controversy while breaking established conventions. Jean Paul Gaultier, Alexander McQueen, Versace. What are your strongest aspirations and most significant goals for this line? Aspirations are to keep expanding the line and creating new collections. I think just trying to keep up and get all of my ideas produced would be a goal in itself. Overall, keeping the brand fresh and successful so that it can broaden itself and cater to various aspects life and style. I never look at failing as an option anyhow. I believe thinking you could fail is already shooting yourself in the foot and setting yourself up for failure. You gotta believe you can accomplish anything, and those who believe that they can accomplish anything, most likely will. Hahaha I love how any other person would’ve probably added in a serious thing when asked the last question but Ashley? Nope. Party!! So cool that you introduced your line on Nanny’s birthday!